Dana R Barrows, CLU®, ChFC®, J.D. 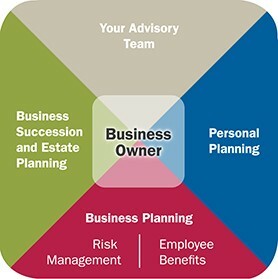 When it’s a matter of planning for the future of your business, and your estate, realizing the need to take greater control over your personal and business life is the first step. Choosing someone who has the experience, expertise, and resources to best address those needs is the next. That is where Dana R. Barrows and his team come in. As an Estate and Business Planning Specialist, Dana will listen, clarify and help prioritize your goals and aspirations before developing a financial strategy designed to help you achieve your vision for the future. Dana is also a fee-based advisor. He is compensated for the time and expertise invested in designing and implementing your personal financial plan. Dana Barrows works with business owners and estate owners throughout New England and beyond, often teaming up with other professional advisors to create the best result for you. My mission is to help clients attain financial security for their families and businesses. I am committed to providing expert guidance and innovative solutions as clients are making some of the most important planning decisions in their lives. Because none of us can predict the future, I will help you prepare for the best and worst case scenarios and create a long-term relationship based on quality service and integrity. Read a weekly Market Update from our Chief Investment Officer. Northwestern Mutual is the marketing name for The Northwestern Mutual Life Insurance Company, Milwaukee, WI (NM) (life and disability insurance, annuities, and life insurance with long-term care benefits) and its subsidiaries. Dana R Barrows is a Representative of Northwestern Mutual Wealth Management Company®, (NMWMC) Milwaukee, WI (fiduciary and fee-based financial planning services), a subsidiary of NM and federal savings bank. All NMWMC products and services are offered only by properly credentialed Representatives who operate from agency offices of NMWMC. Representative is an Insurance Agent of NM, and Northwestern Long Term Care Insurance Company, Milwaukee, WI, (long-term care insurance), a subsidiary of NM, and a Registered Representative of Northwestern Mutual Investment Services, LLC (NMIS) (securities), a subsidiary of NM, broker-dealer, registered investment adviser and member FINRA (www.finra.org) and SIPC (www.sipc.org). Dana R Barrows is primarily licensed in Massachusetts and may be licensed in other states.